I made the following recipe for our California Wine Country dinner as a side dish to go with our main entree. 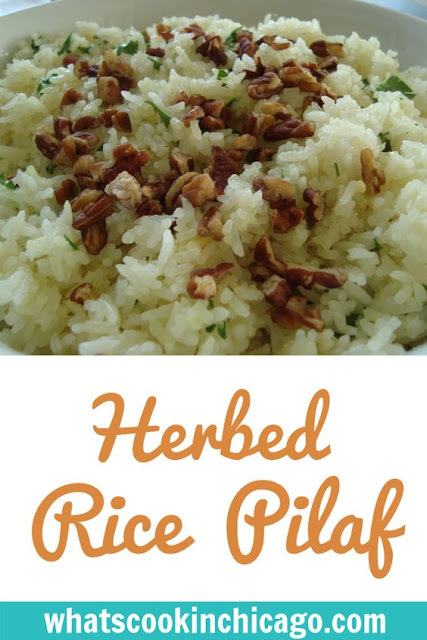 It's a great way to jazz up plain rice with fresh herbs and the toasted nuts add a nice texture too! Melt butter in large saucepan over medium heat. Cook onion and 1/2 teaspoon salt until just softened, about 3 minutes. Add rice and cook, stirring frequently, until edges begin to turn translucen, about 2 minutes. Add garlic, thyme, and bay leaf and cook, stirring constantly, until fragrant, about 30 seconds. I love this pilaf recipe. It is really good. I made this for Christmas Eve and it was a hit. Thanks!